Mildred Warner was born in 1670/71 at Warner Hall, Gloucester County, Virginia, U.S.A.G. 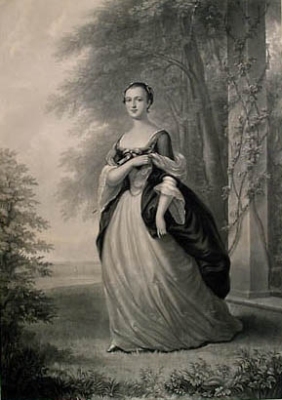 She was the daughter of Colonel Augustine Warner and Mildred Reade.1 She married Lawrence Washington, son of Colonel John Washington and Anne Pope, in 1688/89. She died on 26 March 1701 at Whitehaven, Cumberland, EnglandG. She was buried on 26 March 1701 at Whitehaven, Cumberland, EnglandG. From 1689, her married name became Washington. [S60] Charles and Hugh Brogan Mosley, American Presidential Families, page 52. Lawrence Washington was born in September 1659 at Westmoreland County, Virginia, U.S.A.G. He was the son of Colonel John Washington and Anne Pope. He married Mildred Warner, daughter of Colonel Augustine Warner and Mildred Reade, in 1688/89. He died in February 1697/98 at age 38 at Warner Hall, Gloucester County, Virginia, U.S.A.G. [S60] Charles and Hugh Brogan Mosley, editor, American Presidential Families (London, U.K.: Alan Sutton and Morris Genealogical Books, 1994), page 52. Hereinafter cited as American Presidential Families. Augustine Washington was born in 1693/94 at Wakefield, Westmoreland County, Virginia, U.S.A.G. He was the son of Lawrence Washington and Mildred Warner. He married, firstly, Jane Butler.1 He married, secondly, Mary Ball, daughter of Joseph Ball and Mary Bennett, on 6 March 1730/31.1 He died on 12 April 1743 at Ferry Farm, King George County, Virginia, U.S.A.G. 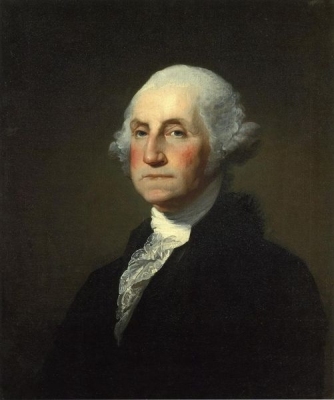 George Washington was born on 22 February 1732 [11 Feb 1731/2 O.S.] at Pope's Creek, Westmoreland County, Virginia, U.S.A.G.3 He was the son of Augustine Washington and Mary Ball. He married Martha Dandridge, daughter of Colonel John Dandridge and Frances Jones, on 6 January 1759 at New Kent County, Virginia, U.S.A.G.3 He died on 14 December 1799 at age 67 at Mount Vernon, Fairfax County, Virginia, U.S.A.G, from pneumonia.3 He was buried at Mount Vernon, Fairfax County, Virginia, U.S.A.G. He was educated in 1749 at William and Mary College, Williamsburg, Virginia, U.S.A.G, as a surveyor.3 He was Official Surveyor of Culpeper County, Virginia in 1749.3 He gained the rank of Major in 1752 in the Virginia Regiment, as Adjutant-General.3 He gained the rank of Lieutenant-Colonel in 1754.3 He wrote the book The Journal of Major John Washington, published 1754.3 He was Colonel and Commander-in-Chief of the Virginia Regiment between 1755 and 1758.3 He was Aide-de-Camp to Maj.-Gen. Edward Braddock, Commander of British Forces in North America between 1755 and 1758.3 He held the office of Member of the House of Burgesses [Virginia] in 1759, for Fredericksburg County.3 He held the office of Justice of the Peace (J.P.) [Virginia] in 1770.3 He was Delegate to the Williamsburg Convention in 1773.3 He was Member of the First Virginia Provincial Convention in 1774.3 He was Virginia Delegate to the First Continental Congress in 1774.3 He was Virginia Delegate to the Second Continental Congress in 1775.3 He was Commanding General of the Continental Army between 1775 and 1783.3 He was awarded the honorary degree of Doctor of Laws by Harvard University, Cambridge, Massachusetts, U.S.A.G, in 1776.3 He was awarded the Congressional Medal of Honour in 1776 for capturing Boston.3 He gained the rank of Lieutenant-General in 1780.3 He held the office of Vice-Admiral of France in 1780.3 He was awarded the honorary degree of Doctor of Laws by Yale University, New Haven, Connecticut, U.S.A.G, in 1781.3 He was awarded the honorary degree of Doctor of Laws by University of Pennsylvania, Philadelphia, Pennsylvania, U.S.A.G, in 1783.3 He was President of the Federal Convention in 1787.3 He was Virginia Delegate to the proposed convention of States in 1787.3 He was awarded the honorary degree of Doctor of Laws by Washington College, Chesterton, Maryland, U.S.A.G, in 1789.3 He held the office of President of the United States of America between 1789 and 1797, the first president.3 He was awarded the honorary degree of Doctor of Laws by Brown University, Providence, Rhode Island, U.S.A.G, in 1790.3 He held the office of Chancellor of William and Mary College.3 He was Lieutenant-General and Commander-in-Chief of the All the Armies of the United States in 1798.3 Was elected without opponent by 69 electoral votes. He refused to run for a third term and - thereby - inofficially instituted the 2-term rule for american presidents, the only exception being Franklin Delano Roosevelt. [S60] Charles and Hugh Brogan Mosley, editor, American Presidential Families (London, U.K.: Alan Sutton and Morris Genealogical Books, 1994), page 44. Hereinafter cited as American Presidential Families. Her married name became Custis. From 6 January 1759, her married name became Washington. [S6] Cokayne, and others, The Complete Peerage, volume II, page 132. [S38] John Morby, Dynasties of the World: a chronological and genealogical handbook (Oxford, Oxfordshire, U.K.: Oxford University Press, 1989), page 173. Hereinafter cited as Dynasties of the World.